Production date: c. 1960 - ? The seventh generation allows the correct use of both automatic and semi-automatic lenses. Inside the mirror box of this model, there are two mechanisms. 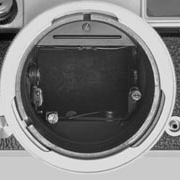 The first, on the left, engage the pin of ASB lenses and the second, on the right, engage the pin of SB lenses that must be mounted on the camera rotated of 120° anticlockwise. This model has also others useful improvements. The dials for speed settings and reminder film type have a thickness of 2.5mm to improve the grip and make easier the rotation of the dials. All the previous models have a thickness of 1.5mm. This model has the rewind crank and a new film reminder dial with ASA 6-1600 / DIN 9-33 settings. In the version 2 the cameras have an accessory shoe placed on the top over the "KW" logo. The interesting arrangement to control the automatism of SB and ASB lenses: two mechanisms to engage the pin of the lenses that must be mounted in a different position using the right notch. A mystery wraps this model. As reported from various sources, the VEB Kamera- und Kinowerke Dresden stopped the production of Praktina IIA in May 1960. In fact the Praktina story ended four years later when these cameras disappeared definitely from the market. In the book SPIEGELREFLEXKAMERAS AUS DRESDEN, written by Richard Hummel in 1995, where are full described all the cameras made in Dresden, the specifications of the Praktina IIA include these three features: the different synchronization, the geometric speed settings of the shutter and the mechanism to control the diaphragm of the semi-automatic lenses. This last feature has the note "in the course of production". 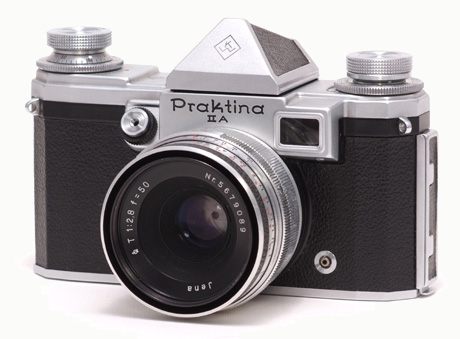 The working instruction to use the SB lenses on this Praktina is dated 1960 and a test of this camera was published on a German magazine in 1961. 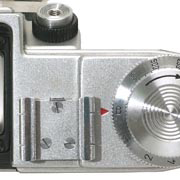 Moreover, starting January 1961, the advertising in German photo magazines carried the indication "Praktina IIA model 1961", an indication that these cameras have different features. It seems all clear, but in the book DER VEB PENTACON DRESDEN, written by Gerhard Jehmlich in 2009, there is a shocking note about this model: "nicht in VEB Kamera-Werke Niedersedlitz für ASB + SB eingerichtet", that's to say that the Praktina IIA, with the diaphragm's control of ASB and SB lenses, was not manufactured from VEB Kamera-Werke Niedersedlitz! It is true? Who manufactured these cameras? This is the mystery that wraps this model. Someone suggests that the production of these cameras was made outside DDR. Nobody knows where and no one gives indication about a different manufacturer. So the manufacturer's name has yet to be discovered in order to complete the story of the production of the Praktina cameras. • Lens diaphragm control: for automatic (ASB) and semi-automatic (SB) lenses. • Viewfinder system: interchangeable eye-level or waist-level viewfinder; lock lever of viewfinder on the bottom-camera; interchangeable focusing screen, matte or matte with split-image rangefinder; eye-level optical finder incorporated in the camera body. • Shutter speed settings: B, 1, 2, 4, 8, 15, 30, X, 60, 125, 250, 500, 1000. 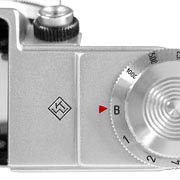 • Flash connection: One socket with manual-switching lever for FP-F-X synch, near film reminder dial. • Film rewinding: Knob with rapid rewind crank. • Dimensions and weight: (without lens and finder) Height 87 mm, Length 146 mm, Depth 59 mm, Weight c. 610 g.